After completing her BA in Digital Art in 2008 at ASU, Erika Ryn felt a strong pull to work with people directly in a therapeutic modality. She stepped out from behind the computers and cameras to begin her journey into the world of holistic healing arts. Her passion for creating accessible, every day ritual in her own life spurred her desire to start a business focusing on helping others create their own rituals centered around self care and celebration. Erika studied massage at the East West College of Healing Arts where her passion for dance spurred a deeper interest in anatomy and kinesiology. 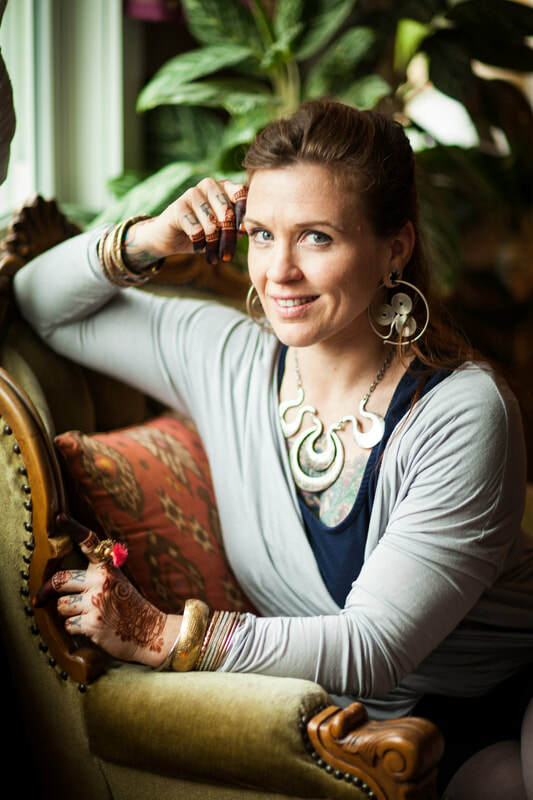 She approaches bodywork as a healer as well as teacher, helping clients develop a personal roadmap to a lifetime of wellness. Her massages incorporate deep tissue, structural bodywork, Chi Nei Tsang abdominal massage, and Thai Massage. To further her knowledge and better support her clients in their movement goals, she also received her 200 hour yoga teacher training from the Lotus Seed School of Yoga. She has apprenticed with Melanie Ooi of Blue Lotus Henna since 2012, and is a passionate student of the art of henna body adornment. It is with gratitude and respect that she participates in this ancient tradition of blessing and celebrating through henna. It is incredible to see the transformative power of wearing henna body art and an honor to participate in important life transitions with her clients. She continues to be a lifelong student of bodywork and healing arts, furthering her knowledge through self study and numerous continuing education opportunities.